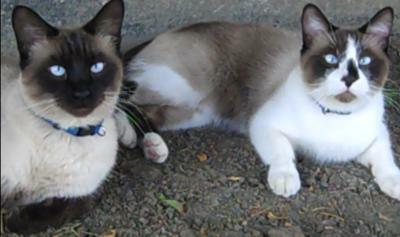 My chocolate point Siamese is not a pure bred, his mom (Dizzy) is a long haired black and white domestic and his little brother (Hootie) is a tri-coloured Ragdoll. 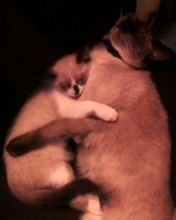 I know this is odd, but I guess Dizzy is just talented when it comes to having kittens! Anyway, Ausie (my chocolate point Siamese) loves car rides. I can't be sure but when he was just a little guy he went missing and I found him curled up in the lap of a police officer who had stopped to question some people in our neighbourhood concerning a break-in. Well, it seems Ausie committed a break-in of his own when he jumped into the cop car through an open window! Another time my mom had stopped by to drop a few things off with me, and being a hot summer day, she had all her windows open in her car. About five minutes after she left, she returned, horn honking and a very confused look on her face. Neither one of us had seen Ausie jump in her car and it wasn't until she was on the highway that she saw him through her rear view mirror stretched out on her back window enjoying the view. We have now learned to check all vehicles inside and out before leaving to make sure he is not trying to catch a ride with anyone. Another thing that Ausie does that has us crying from laughter and thinking he should get into acting is the Oscar-worthy arguments he has with me. Any Siamese owner knows how vocal they are and how they can sound like they are yelling at you rather then asking you for something. Whenever Ausie comes in yelling at me, I respond with a tone fairly equal to his (demanding and diva like!) He will then lower his voice and I lower mine until our "conversation" goes from being a demand to a very sad talk. He responds to my tone and every time I sound sad, he will hum. If I speak loudly, he howls. Eventually our talk ends with me saying "Aww, that's so sad" in a voice that sounds like I'm on the verge of tears and he will lower his head and let out a really quiet hum that makes him look and sound as though he is crying, it just breaks your heart with how sad he sounds. LOL! Thanks for your great stories about Ausie - his love of cars and his talkative nature. We also have to be very careful to check vehicles belonging to anyone who comes to the house before they drive off - my cat hates car rides but loves exploring cars and vans! I love the way that Siamese cats are able to carry on a conversation, and Ausie certainly sounds as if he's got a full range of expressions!